We work closely with many of the UK's leading exhibition stand designers and builders, Large format printing is our area of expertise, and on that score we can offer you unmatched service that combines both quality and unbeatable pricing. From basic pop-up and roll-up systems through to bespoke graphics that can be printed onto a variety of exhibition approved substrates for application to walls, hanging banners and more, our print is produced to the highest possible quality, for a highly professional near photographic finish. We know our way around the exhibition display graphics markets, we are fully conversant with statutory fire regulations and the Health & Safety legislation relating to permissible materials and substrates. We provide a full on-site fitting service. We can work hand-in-hand with your stand designer and their contractors to ensure your graphics are both produced and installed to your specific requirements. 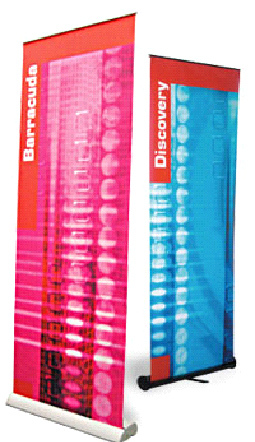 Pull up banners stands offer a very quick display solution, ideal for exhibitions, conferences and displays. They give the user an immediate presence helping to display the products or service in question. They are versatile in their own right being able to join certain systems together, adding lighting or even using different size pull up banners in both width and height. Please see below for the different widths of pull up banners we do. Our banner range is one of the most extensive in the market and offers a wide choice of sizes, finishes and design features. In conjunction to this our turn around times are second to none, so if you need that extra piece of display equipment such as a pull up banner tomorrow, then we will make sure you get it! The range includes tension banners, roller and cassette banners, motorized rotating banners and outdoor banners; offering style and quality at very affordable prices. All our banners are reusable and most are supplied complete with carry bag. We are constantly looking for new products to add to our range and will also take advantage of new products to give our customers more choice. Our cassette banners have the additional advantage of removable graphic cassettes to enable rapid change of graphics - ideal for promotional campaigns and retail display. It is also a very cost effective way of displaying a wide range of products, as you only need to have a minimum of one base unit, but you can have as many graphic cartridges as you like! There is a range of lighting available for all our pull up banner stands, please feel free to ask.